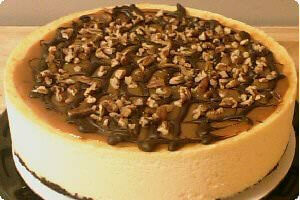 This Turtle Cheesecake is something special; a New York Style cheesecake with a top layer of Georgia pecans swimming in a silky delicious caramel sauce and drizzled with semi-sweet chocolate. The cheesecake rests on a chocolate cookie crust and the result in not only pleasing to the eye, it is a velvety delight to your taste buds as well. It is a 9-inch round cheesecake that serves 8-10. The Turtle Cheesecake is handmade, freshly baked specifically for your order and will ship 2 business days after your order is placed. It will be shipped directly from the baker in its own thickly insulated shipping box, packed with dry ice, and will incur a separate shipping charge. Ingredients:cream cheese (pasteurized non-fat milk and milk fat, cheese culture, salt, stabilizers [xanthan and/or carob bean and/or guar gums]), sugar, eggs, sour cream (cultured pasteurized grade A milk and cream, enzymes), fresh lemon juice, vanilla (vanilla bean extractives in water and alcohol [41%]). Topping: caramel (corn syrup, sweetened condensed milk (milk, sugar), corn syrup solids, water, butter [cream, salt], salt, di-sodium phosphate, artificial flavor, propylene glycol, pectin, potassium sorbate [preservative]. Ganache: heavy cream (less than 1% of mono-and diglycerides, polysorbate 80, carrageenan), semi-sweet chocolate (sugar, chocolate cocoa butter, milk-fat, soy lecithin, natural flavors), pecans, chocolate. Cookie crust: sugar, enriched flour (wheat flour, niacin, reduced iron, thiamine mononitrate [vitamin B1], riboflavin [vitamin B2], folic acid) high oleic canola oil and/or palm oil and/or canola oil and/or soybean oil, cocoa (processed with alkali), high fructose corn syrup, cornstarch, leavening (baking soda), salt, soy lecithin (emulsifier), vanillin - an artificial flavor, chocolate.